Weeklong protests allegedly started over demolition of a popular Istanbul park – an issue we covered months ago here. 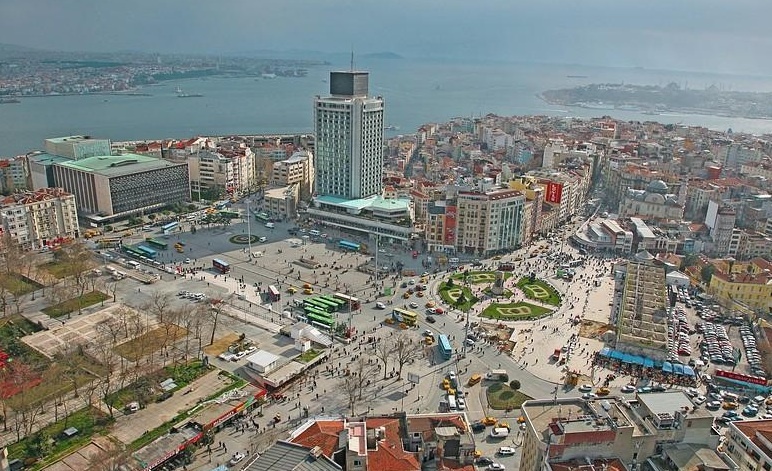 Taksim Gezi Park site is earmarked for a new shopping mall. Urban development sparks protests the world over, so what blew this one to epic proportions? A peaceful protest began in response to government actions viewed as favoring profit over people and nature. But, similar to “Occupy” movements and the Arab uprisings, the Taksim demonstrators embrace many distinct causes, there is no singular focus. Sure, there are environmental mandates. There are demands for free speech and entitlement to nonviolent demonstration. There are pleas to maintain separation between secular government and majority religion. There are calls for greater protections for Turkish democracy and human rights. And the elephant in the Square may be Turkey’s muzzled media, which is unable to report on it all. There are more journalists in jail in Turkey today than in any other country, and penalties are steep for broadcasting state-sensitive stories. Most of the news concerning the protests has come from social media which is fascinating but unreliable, beholden to the writer’s point of view. When branded organizations join the fray, resultant media attention and self-promotion further skew the story. Greenpeace sent Green Prophet an update saying that is has declared solidarity with the park protestors, demanding the right to peaceful protest and urging that people and planet come before private profit. They opened their offices, adjacent to the park, offering protesters first aid and a place to rest. Police are using tear gas, water cannon and pepper spray to disperse crowds. Dozens of protesters and onlookers have been arrested and injured; figures vary over persons killed. On the international level, Greenpeace is calling for an immediate end to police violence. Decrying police brutality and embracing open space preservation are necessary and noble actions, but they only tell part of the Taksim story. The nation is bi-polar. Turkey sits on two continents, but also straddles two worlds. The NATO darling is positioning itself for EU membership, and aggressively seeking to expand tourism – a cornerstone of its economy with $25 billion in 2012 revenue. It’s investing in improved infrastructure for national transportation and growing the world’s largest airport. Meanwhile, Prime Minister Erdogan and his Islamist party are accused of extending their power over the government at the expense of constitutional checks and balances, replacing democracy with authoritarian leadership. Small erosions of personal freedoms (evolving bans on alcohol, smoking, and western dress) are viewed by secular Turks as further proof of the government’s Islamic agenda. How’s that going to work in the new tourism brochures? Will it combine with current events to spin new Visit Turkey slogans? Come visit, all you Germans, Russians and Brits – this place is a gas! A court ordered temporary suspension of park demolition, but the action may be too little too late; protests are reported to have spread across Istanbul and have erupted in Ankara too. Watch this place. Or at least watch what little is being reported. Many thanks for this informative article. As an English ex-pat living in Turkey I’m upset that such events have occurred but more so that the “western” media has reported the events with such a biased viewpoint. The recent “ban” (time restriction) on sales of alcohol is nothing more than an alignment to the practices which have existed in many European countries for many years – when one sees alcohol shelves in Tesco or Sainsbury’s coved on Sundays does anyone say “they are trying to Islamise the West”? The ban on smoking in closed places (still not policed sufficiently, in my opinion) is a great step forward for those like myself who never smoked and are very sensitive to smoke. AFAIK in some American states it is illegal to smoke at bus stops and in open places (while standing still? ); does anyone say “they are trying to Islamise America”? I have never seen anything like a ban on western dress. Living in Ankara for the past 13 years I’ve seen many different styles of clothing, some you wouldn’t even see on the streets of London (people would be embarrassed to wear such skimpy clothes there). If the widening freedom for ladies to cover their heads (according to THEIR OWN FREE WILL) in public places and offices is seen as a “ban on Western dress” then the observer needs to re-tune their receivers and think about “human rights” in a more open-minded way.